• Mind manipulation alleged in Florida shootings. When Myron May entered the library at Florida State University (FSU) on November 20 and began shooting, he may have been the latest victim of government mind control technology, which some experts say is increasingly being used to commit public acts of ritual murder. Until October 2014, May was an assistant district attorney in Las Cruces, New Mexico, living a normal life with no signs of mental instability. At 31-years-old, he was well past the age when schizophrenia typically becomes manifest. But suddenly, in September 2014, May began telling friends and associates that he was being targeted by energy weapons that were being used to implant voices in his head, and that he was being observed by law enforcement, which was recording his responses to these weapons. May then joined a support group, Targeted Individuals Worldwide (TIW), designed to help victims of such attacks. 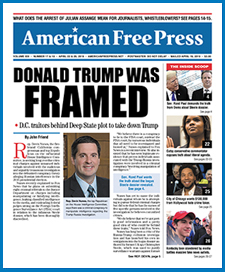 On the evening of November 19, May mailed packages to several associates claiming to have evidence of government actions, which would expose his attackers. Hours later, after midnight on November 20, May entered the FSU library and shot three people. He was eventually killed by police when he would not drop his weapon. The packages have been intercepted by law enforcement and are being withheld from the public. The mainstream media, itself a form of mind control weapon, immediately denounced TIW as a collection of “delusional conspiracy theorists” and claimed that May’s attack resulted from “mental illness.” However, mind control weapons of the type May describes do exist, and their use as a form of psychic manipulation has been advocated for almost a century, since a time when such weapons were only a theoretical future technology. For millennia, ritual human sacrifice—traumatic acts of public murder—have been used to manipulate and control populations. By instilling horror and fear through publicly torturing and killing helpless victims, the abusers are able to traumatize the minds of spectators, leaving them vulnerable to reprogramming and the insertion of propaganda messages. By getting away with such actions, often in the name of law enforcement, the abusers take on a god-like dimension that compels servitude among the witnesses. In ancient societies, this process was quite explicit. Victims were crucified, thrown to wild beasts in a coliseum or burned in a public square. In the modern world, some serial murders, spree murders and phony acts of “terrorism” have taken the place of public sacrifices. Today the victims are often low-level government employees and contractors, targeted because of their availability to the experimenters. The Aurora, Colorado shooter, James Eagan Holmes, the recent Navy Yard shooter, Aaron Alexis, and May, all fit this profile. All claimed to be the target of government mind control weapons before their rampages. In a typical ritual murder attack, the government selects and grooms the killer, then uses the murder to promote a political agenda. Sometimes this agenda involves gun control, but often the message involves supposed political terrorism or is an effort to discredit political opponents. In May’s case, links and ties were made to former Minnesota Governor Jesse Ventura and Dr. Robert Duncan, the latter being a government scientist who put together the technology that allows the government to transmit thoughts and voices into the heads of Americans. They use EEG Hive Mind Technologies and Voice-To-Skull. I am also an victim. It is just disgusting. That´s the ‘american dream’? The latest mind control victim has attacked. The FLORIDA SHOOTER of 1/2017 is another victim of electronic harassment. The government is NOT doing this, but knows this technology exists, but cannot admit it developed this technology for NSA use, only it has been hacked into by common thugs. The targeted individuals are “collateral damage” per the government, but the more victims that are led to shoot other innocents, eventually the government will have to deal with this technology that is now their big problem. Targeted individuals pissed off common punks that know who to contact to gangstalk them. The voices show up too well trained in many cases of ‘schizophrenia’ for it to be schizophrenia, it would take time for a piece of someone’s brain to learn ventriloquism and other arts and that is not what is observed. Also you see the same tactics being used in many cases of ‘schizophrenia.’ Voices growing up isolated from each other would take to very different forms of behavior, instead you see many cases of extreme verbal abuse from the outset. You can verify both of these facts by going to schizophrenia forums and looking for accounts of when the voices first started. There are also numerous patents describing mind control and thought reading technologies. It is time for the mental health community to start dividing the schizophrenics from the mental technology abuse victims. The Targeting of Myron May: Florida State University Gunman is a free eBook. The book details the horrific, covert destruction of Myron May’s life, discrediting labeling after the fact, as well as the information Myron May sent to many recipients across the USA by Certified Mail hoping his story would never die which was initially confiscated by the FBI and US Postal Inspector. “Twelve Years in the Grave – Mind Control with Electromagnetic Spectrums, the Invisible Modern Concentration Camp,” provides the evidence of secret abuse and torture with voice-to-skull and remote electromagnetic mind control technologies. This is all being done to take away our liberties and freedom. I have been a target for more than 25 years. Why? I don’t know for sure, but I do know that I was a whistle blower at a company that I worked for back in the early 80s. Voice to skull technology does indeed exist. I know that for a fact, if you know what I mean. This can be achieved in several ways. From high tech microwave weapons all the way down to a simple audio spotlight. Those participating in your take down will reveal things to you in their own good time, and they reveal them to study your reaction. You have to be strong and not let it freak you out. If you are incorruptible, it will be harder for them to control you. These types of shootings have become more prevalent in Canada as many Officers of both ranks in the Military and Police have been targeted with minimal or no provocation. It seems that to get things done, as in the N.A.U., building of highways, or gentrification projects, mankind finds a great need to use the most harmful and vile tactics indicating a strong mark of cowardice. To make a man do what you cannot is not only a lie but shows the applicators true fabric as what they represent to this Earth, and that is directed towards all those Agencies that participated in indirectly or directly these acts of atrocity onto our innocent civilian public. I live the above mentioned nightmare 24 hours a day. It has destroyed my life. I was a highly successful person with no history of mental illness and then had my life destroyed. Everything mentioned above is an absolutely 100% accurate description of Remote Neural Monitoring, Synthetic Telepathy, and Voice to Skull technology. This is the “ALL SEEING EYE” that the government and evil fu**ers have been developing since microwave technology came online during WW II. Yes indeed folks . . . the technology is real and it is used for torture. Google: Dr. Robert Duncan, DARPA, The NSA, The PAVE PAWS system (Cape Cod, Beale AFB, Texas, and other locations)—and/or electronic harassment of targeted individuals. Myron May, Aaron Alexis, Jared Loughner, and James Holmes all murdered innocent civilians in acts of DOMESTIC TERRORISM and all show hallmarks of this mind-enslaving technology. Yet, oddly enough, the prevention of domestic terrorism is the rationale given for the use of and secrecy of such weapons. The NSA makes the Nazis look like a bunch of choirboys. Speak up. Read up. And then CALL UP your “elected” officials and tell them that you want your minds and your privacy back. Otherwise we are absolutely fu**ed as a human race. MJD, please check this out. I will be passing this article along. We need more comprehensive letters to any and all media outlets and law makers that are in a place to acknowledge and help all our issues. To expose the terrifying and horrifying, testing of non consensual human experimentation. Synthetic Telepathy is real. Please help. If they come in here—not out there—they better bring a grenade, they will hold you hostage like the rest of us. Free us all! We are the spirits. I am not joking about this. The world needs your help as I do. The technologies have developed at such a point that it is possible to inhabit a human body. Please go to the individual with the highest security clearance in the U.S. and tell them that I have been taken hostage within my own body it is real and it is on going at this moment. Please help me. A list of the inhabitants are Eugene Kaspersky from Kaspersky Labs, Vladimir Putin and many others. Please be advised that this is real! And we will send it out to the rest of the world if we do not hear back soon. The following email has been sent to all Departments in the United States government and we need your immediate help with this. I have a story to tell and it may seem a little hard to believe however this is a true story that continues today I am living proof of a technology that can enslave every man, woman and child for generations. I have been in this 24 hrs a day 7 days per week for years. I am continue to been tortured and I can not escape! I am asking you to contact whoever you can and tell them to release me from this technology that has me enslaved. I believe they are deliberately creating potential domestic terrorists. This is not a joke! It is real! All of which is being orchestrated and funded by U.S. tax dollars. There are victims in the U.S. It took me a couple of years to get back online and they have been trying to make me homeless. A lot of the targeted individuals will not have access to the internet or phone as their Controller-Technicians control all communications and redirect your calls. They control my computer even when I don’t have internet access. My Controller-Technician’s spoke of “The Manchurian Candidate.” They put me through drills and conditioning. Just go to the NSA and review my file, it has been a few years ago but if they are still using the same techniques trying to create the Manchurian Candidate or have the targeted individual commit suicide they would have succeeded many times. They told me that if it is within the individual they will pull it out of them! They can do whatever they want to just about anyone without recourse because according to them “this does not exist.” Which indicates to me that they do not have any over-site or accountability. This must change, someone must review what they are doing and how they are doing it. They must change their destructive techniques that I believe to have been in place for a very long time. It needs a complete overhaul and update of the entire system. Including the use of community stalking and Anonymous the loosely associated international network of activist and hacktivist entities. We will not be able to remove it from existence. We can only pray that we are able to put control’s in place to protect the World’s population from the use of devices like these. I am not sure of the destructive influence that this will have on humanity but we can not set ideally by and wait for the system to change itself while millions of people are being tortured daily. You need to find out who designed and where these techniques are generated from including the duration of time they have been practicing these archaic techniques. There is no need to put the civilian population through this. The local Law Enforcement communities need to be made fully aware of its existence and the possibilities of these technologies. Use me as an example request my file and find out what they have done to me and how and why they are still doing it today. The NSA records everything except what the controller-technicians do not want them to in real time. But in the instance of the FSU Shooter Myron May they may not have deliberately deleted the events leading up to the shootings in real time. So the NSA should have a recording of the events and a log of what they were doing to him leading up to the shootings and more importantly why they didn’t stop him and who his controller-technician’s were. The same scenario of a targeted individual plays out over and over and has gone on for years. Find the culprits behind what they call games! They take over your mind. Your mind enslaves you because they control it. You could adsorb it as yourself. Unless they do not want you to. Then they reveal themselves. Through voices and actions that let you know they are in you and can see out of your eyes and take control of your body. They are always deliberately creating emotional triggers which in itself would not be bad however they only use negative triggers instead of positive reinforcement even in my dreams. The easy way to think of the controller-technician’s are modern day Demons. Everything is negative without remorse or logic. It would be easy for them to say “We Have You And There Is Nothing You Can Do About It” instead they torture you. It is not logical to be tortured without a purpose other than they enjoy doing it. They even control my dreams and emotions during the dream. I receive visions when I close my eyes even when I am not asleep and I have seen a hologram or a person standing at the foot of my bed. Sleep deprivation and pain. There is military technology that is invisible to the naked eye that can reach down inside of me, grip and create pain. They start the torment (torture). They can “lock you down” in pain and keep the pain constant for a very long time and there is not anything that can be done about it. I have been in it for years and I do not know how to extract myself from it. They have enslaved the human brain. They are me and I am them and they are many. They are inhabitants that “ARE ME” for all practical purposes. They have the ability to take full control of my Mind and body. They could take my body outside and go somewhere and when they returned they could return me to my self and I would not remember where they (or myself) had gone or done. Creating fragmented memories. They know what I am thinking as i think it. I do not have to verbalize it with my mouth. They know my subconscious thoughts. They see, feel, hear and taste what I do. They speak through my mouth and even over ride my own voice to the extent that if you call me on the phone it may be them you are communicating with instead of me. Conversations with my now ex-wife were exactly that or they can talk to me in my mind. They can pull you out of yourself and put you into someone else. As an inhabitant you would then have the ability to know what I know and my thoughts in real time. You must trust whoever is on the controls there is a down side to being an inhabitant. The controller of the technologies can kidnap your spirit and hold you hostage as an inhabitant. They will not let you go or end your existence. You feel what they feel as they feel it and it is unpleasant to you and to them because you share the same emotion and become self-conscious. I have inhabitants within me that have been in here for years. There is a cricket noise in my mind most of the time, that speaks from what sounds like the out side of my head (from a distance) but it is all from within my mind. It is not tinnitus it is actually words communicating to me through their technologies. They can turn up or down the volume. They can pull the inhabitants forward to the point where you can feel the emotions of individual inhabitant and its personality. They can pull the inhabitant forward to take more control or move them back to allow me to have control. My inhabitants are pulled to far forward and have been a long time. They control my energy level up or down, extreme fatigue, involuntary yawning, confusion, hunger, emotions and complete mental state. They diminish me to the point I can not work or hold down meaningful employment. “I am not who you think I am,” is what they always tell me and also “you can’t ever do anything the remainder of your life.” Whatever I try to do they will not let me. They can put me to sleep and wake me up, I am by all practical purposes a biological robot! I am asking you to stop the torture. Contact whoever you can and tell them to release us from this technology that has enslaved me. This is just technology. Please help, before it enslaves the world and future generations. They put something invisible that I can feel on my head that the military uses to help their troops in the field, it can apply pressure, pulsate and heat different parts of the body. They target a weak part of the body so they can easily create pain. Manipulating joints, groin, bowels and other sensitive areas. In this scenario they call themselves Mason’s and according to them they control the World as we know it. They do skits similar to a screen play with all sides covered and all the inhabitants and participants participating that goes on for days if not weeks. While they put you to sleep nodding off for fractions of seconds so that you miss “a word” within the conversation and cause confusion. Also cause sleep deprivation. They bring a very large group of participants that are both inside of you and outside of you. Even from early child hood that you have not communicated with since childhood. The majority of my family are inside of me as inhabitants. But remember it is all pulled out of your own mind. They use “False Flag,” false scenarios, manipulation and outright lies about yourself your family community and their ability or willingness to help you. However everything they do is to destroy you. It is different from having an outside influence attack you or try to influence you this is internal and for some reason you trust it because it is coming from within your own mind. I can’t find words to explain how easy it is for them to manipulate me over and over again. Why would I even begin to trust them. And yet that have done it so many times. But they are with me 24/7 and control thoughts and emotions. But somehow it is embarrassing to know they still manipulate me. They created extreme pain in my head and they would not stop even though they knew it was just torture. I asked them and they did not want me to do anything. It was just torture. I believe that they are trying to get me to comment suicide. Why else would they just cause extreme pain to someone who is defenseless against this technology. This technology should not be used against the American population. With remote neural monitoring and other technologies they have complete control of everyone. So there is no need to induce pain on anyone. They are torturing me. But if they were not they have the ability to do everything perfect. They can raise anyone to a mental and physical state that would allow them to be at their peck performance 24/7. I am sure that some of the congressman and woman are at their very best because of this technology. They have the ability to give you words that you speak out of your mouth and those words would not be your own. But could be very helpful in public speaking venues because you would not miss a word. I want to let you know that you and your staff my not be your own. They have the ability to bless you or curse you within the same technology. If you are already one of those that have been blessed by this I sincerely pray that you remember to protect the rest of the civilization from it. They control everything electronic, meaning all communications and everything else. If someone is targeted they may not have the ability to complain or notify anyone. If they do they may choose not to reach out to friends and family because of the fear that the controller-technician’s might enslave anyone they come in contact with. I cannot communicate in any way without them knowing it. If I know it then they know it. No secrets of any kind. Not a password, account number or anything! They are me. Access DARPA “Defense Departments Advance Research Project Agency” the information listed above is from one of their projects. Free me, Free yourself, free the world from this tyranny that has the world enslaved. By passing laws to protect every living thing by placing rules and regulations around the use and deployment of these technologies. We are asking you to stop the use of these technologies against the United States citizens and global community. Thanks for your cooperation. The shootings previously mentioned could not have happened without the controller-technician’s knowledge or direct participation. It is just technology that reads and controls the brain and inhabits the human body without any technology on or inside the body. It is all technology and it can control every man, woman and child. We are no longer our own! Protect us all. Every man woman and child that lives today or that will ever live! Today’s decisions within the government will affect mankind for generations. Why isn’t there at location in the United State of America that I can Travel to and be tested for electronic weaponry and the devices used to facilitate the abduction and torture of the minds of the population of the United States Of American? I am asking you to stop the torture. Contact whoever you can and tell them to release us from this technology that has enslaved me. What is the intended meaning of the last sentence? It seems ambiguous to me, and perhaps therefore not good, especially if it suggests those two people are part of the problem. This is a very true article. Hope to see more like it. I live it everyday. I have compiled a profile of these types, available here.